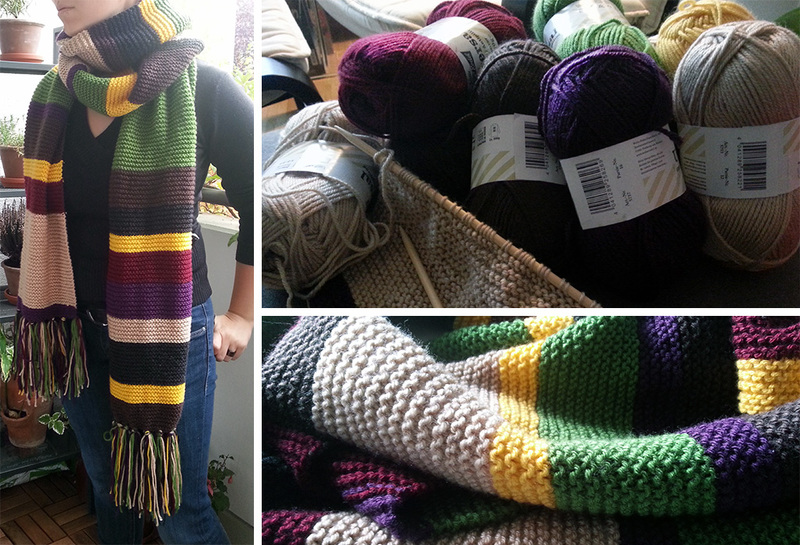 For many is Tom Baker THE Doctor and for many more the 4th Doctors Scarf is the best known symbol of the whole series. And now when winter is coming, why not knit your very own one? It’s super easy! Your first thing to do will be be a visit to your favourite handicrafts shop to get the right wool. Of course, you can buy it via the internet, but personally I like to know how it feels before I buy it to preserve myself from any scratchy surprises. Of course there are thousands of websites discussing the right colour shades. But my experience in the handicraft shop was, that it’s difficult enough to find seven roughly right colours of the same brand & size. Here you have to trust your own sense of colour, to find what you like best. You are knitting only plain stitches. With this you get this slightly rough look. Start with 60 stitches, turn the piece around and knit 60 plain stitches back. Again turn around. and so on. All colour-blocks have even numbers of rows. That means that the “double line” which appears, when you change the colour, should be always on the same side of your scarf. At this point my scarf was 2,5m long, and for me that’s enough. If you want it longer you can either wait (it’ll turn longer because of its own weight) or you can use blocking. For your perfect replika you’ll have to add tassels. 12 tassels on each end, here you can use your leftover wool. For each tassel use appr. 14 threads (20cm long). Knot them with a loop into the stitches of your scarf. And finished. Now would you like a Jelly Baby? !